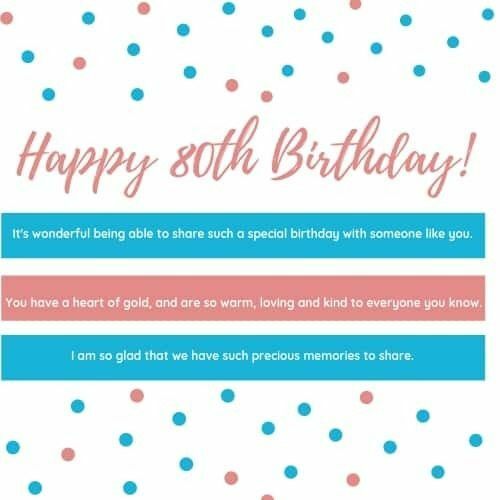 80th Birthday Wishes - Perfect Messages & Quotes to Wish a Happy 80th Birthday! 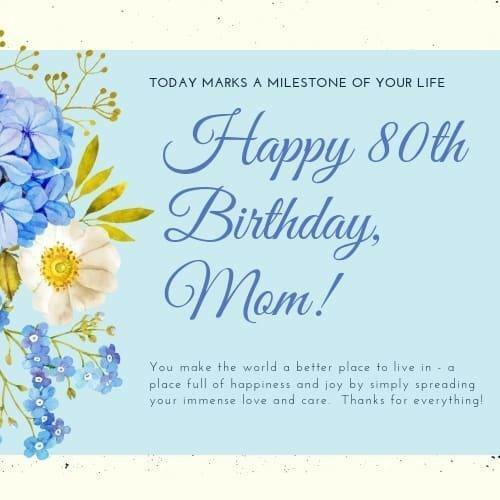 Looking for just the right way to send Happy 80th Birthday wishes to Mom, Dad or another special man or woman who is turning 80? Try one of these unique messages or quotes! Feel free to print any of these wishes you'd like. Simply click on the image, and a ready-to-print version will open in a new tab. Lucky for you, vintage is in. Happy 80th Birthday! Everyone gets to be young once. Your turn is over! You're not old, you're a classic. It's your 80th birthday - feel free to wine if you want! I hope I'm as wonderful as you are when I turn 80...even half as wonderful would be great! You've learned so much in 80 years - the important thing now is to try remember it all! I'm not saying that you're old - but your candles were more expensive than your birthday cake! A true friend knows how old you are...and stays for the party anyway. Happy 80th Birthday! Happy 80th birthday to my best friend! Here's to another year of laughing at our own jokes and keeping each other sane! Take every birthday with a grain of salt. This works best if the salt is accompanied by a margarita. Like a fine wine, we get better with age...or rather, we feel better about our age with lots of wine. Happy 80th birthday! May your 80th birthday be filled with magic moments - and lots of merlot. Don't get all weird about growing older. Our age is simply the number of years the world has been enjoying us. Happy 80th Birthday to someone who is forever young! 80?? Don't panic - you've still got it! The hard part is remembering where it is. At 80, you're still playing with a full deck. So what if you shuffle a little slower? You'll never be old as long as your mind is young and your heart is pure. In other words, you're screwed! On you're 80th birthday, remember: you're only as old as you feel. So don't go around feeling old people. Thinking about getting a tattoo for your 80th birthday? The best bet would be your name and address. Thank you for always being older than me - May this year be a fantastic one. Happy 80th Birthday! Turning 80 is just like turning 27 in Celsius. Don't think of it as turning 80. Think of it as 18 with 62 years of experience. Remember, 80 is only 13 in Scrabble. Age is a question of mind over matter. If you don't mind, it doesn't matter! Happy 80th Birthday! Turning 80? Keep in mind - you're only as old as you remember you are! You're not getting older... you're increasing in value. 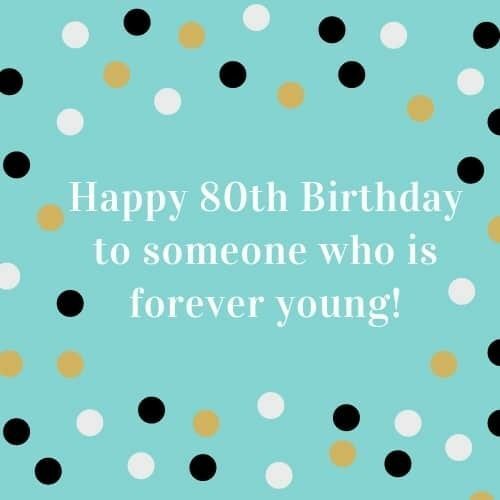 Have a fabulous 80th birthday! Today you're about 29,200 days old. Now, doesn't that make 80 sound young? With age comes new skills. Now that you're 80, you can laugh, cough, sneeze and pee all at the same time! Don't let turning 80 get you down...because it's too hard to get back up again! If things really do get better with age, then you're approaching perfection! Birthdays are good for your health! Studies have proven that people who have more birthdays live longer. Don't pout because you have 80 candles on your cake. Just be glad you have the strength to blow the damn thing out! Birthdays are like glazed donuts. Sometimes it's better not to remember how many you've had! Just think of 80 as 8 perfect 10s! Age and glasses of wine should never be counted. When you look back over 80 years, I hope that your memories are warm ones. When you celebrate today, I hope that your heart is filled with love and joy. When you look forward to the future, I hope that all your dreams and wishes come true. 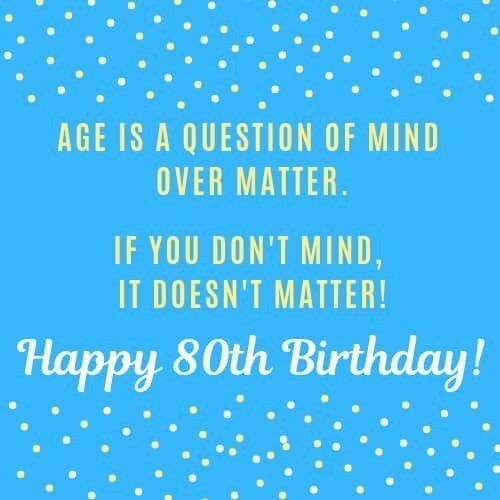 May you have a happy and healthy 80th birthday! May you enjoy many, many more beautiful days ahead of you. 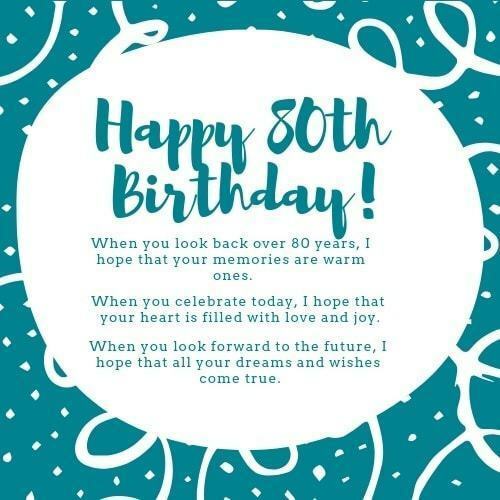 I hope your 80th birthday is filled with love from family and friends, unforgettable moments, never-ending joy, and happy, happy memories. I'm so lucky to have someone as special as you in my life. On your 80th birthday, I hope that you are blessed with love, health and happiness for many more years to come. Congratulations on your 80th birthday! You are truly an inspiration. I'm so blessed to have you in my life. 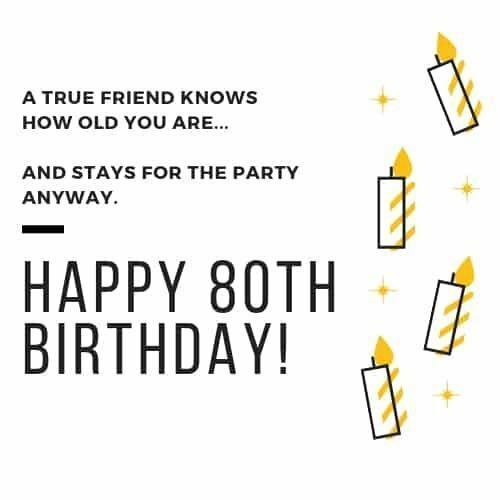 I hope your 80th birthday is as special as you are. It's wonderful being able to share such a special birthday with someone like you. You have a heart of gold, and are so warm, loving and kind to everyone you know. I am so glad that we have such precious memories to share. Count your days by smiles, not tears. Count your age by friends, not years. Wishing you a joy-filled 80th birthday! Age is just a value. The higher the age, the higher the value. I hope your 80th birthday is full of sunshine and rainbows, love and laughter. You deserve the best day ever! May everything happy and everything bright be yours on your birthday from morning to night. Enjoy your 80th! You've gathered 80 years of fabulous memories. I hope today is a day full of new fun and surprises. Happy 80th Birthday, Mom! You make the world a better place to live in - a place full of happiness and joy by simply spreading your immense love and care. Thanks for everything! Thank you for being my heart's first home. I wish you the most wonderful 80th birthday ever! Of all the moms in the world, I'm so grateful that I got you. I hope your 80th birthday is unforgettable! Happy 80th birthday, Mom! Now that I'm older, I want to thank you for never leaving me in a shopping cart and running away. It must have been tempting. On your 80th birthday, I hope you enjoy all the beauty and love that surround you. Thank you for being such a special part of my life. Your 80th birthday is a milestone that makes me realize that my love and respect for you grow stronger each day. Happy Birthday to the best Mom ever! 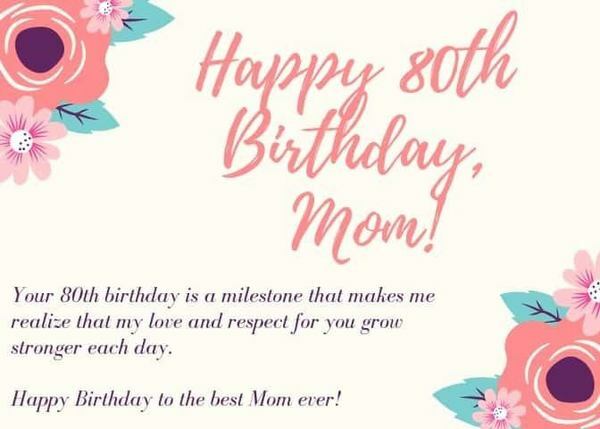 Sending you an 80th birthday wish that's wrapped up with all my love! I hope that the sun shines as brightly on your birthday as your love has always shown on me. Happy 80th Birthday to the most loving mom ever. We have the perfect mother and daughter relationship. You're my mother, and I'm perfect. Hope your 80th birthday is full of laughter and love! Happy 80th birthday to my amazing Mom! You're not only my mother, but you're my best friend. There is no one in the world that could ever take your place, and you mean more to me than you will ever know. Mom, Happy 80th Birthday! I hope your birthday is as bright as your smile, as sweet as your love, as fun as your spirit, and as wonderful as you are. Thanks for always being there for me. Happy 80th Birthday, Dad! On your 80th birthday, I'm thinking of you and all the wonderful times we've shared. Thank you, Dad, for so many amazing memories and experiences. As each year passes, I realize just how lucky I am to have such a wonderful father like you. You will always hold a special place in my heart. 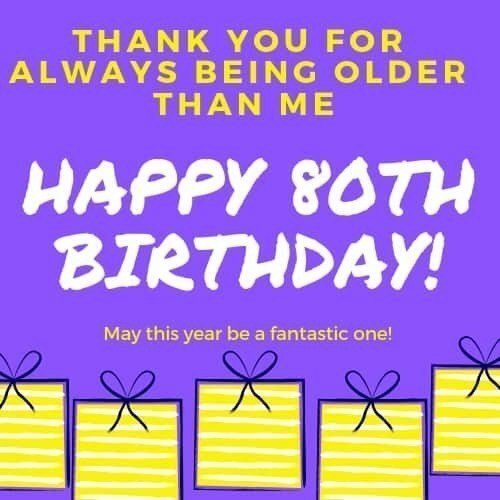 I hope your 80th birthday is as fabulous as you are! Happy 80th birthday to the greatest man in the world: my friend, my protector, my father. No gift can ever match the love and affection you've given me all the years of my life. Have a wonderful 80th birthday, Dad! Dear Dad, Thank you for sharing your wisdom. Thank you for believing in me and always being there when I need it most. 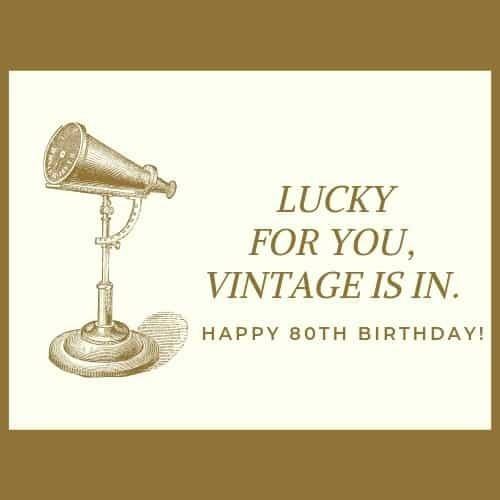 I hope you have a joyous 80th birthday and an amazing year ahead! God must have sent you into my life so that I would always have love in my heart. 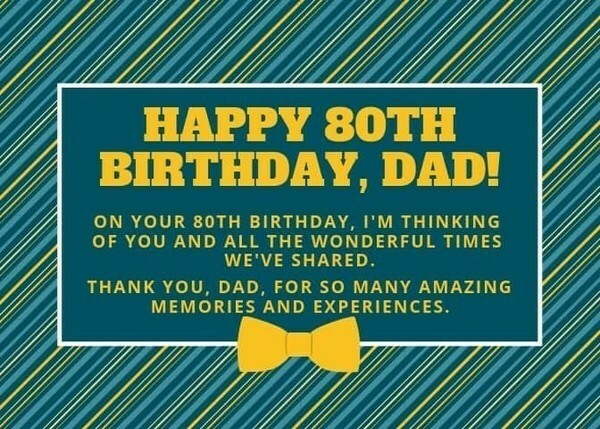 I wish you the most amazing 80th birthday ever, Dad! Happy 80th Birthday, Dad! Having a Dad like you has made my life so much happier and more complete. I've learned so much from you, and I treasure every moment and lesson. On your 80th birthday, I want to take the time to thank you for all that you've done for me. I love you, Dad. Superheroes are one in a million. An amazing Dad like you is once in a lifetime. 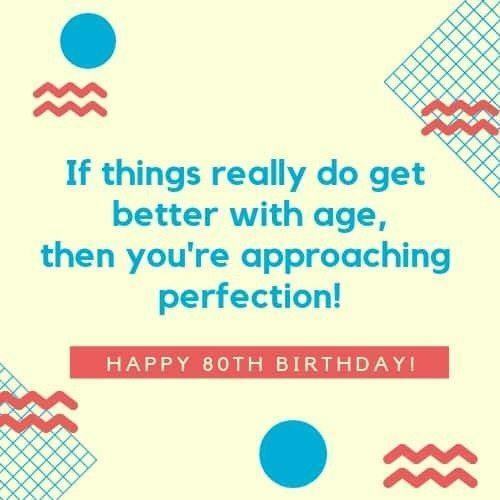 Have an 80th birthday that is as wonderful as you are! Happy 80th Birthday, Dad! I wish you a fabulous birthday, because you are a fabulous Dad. Enjoy your day! 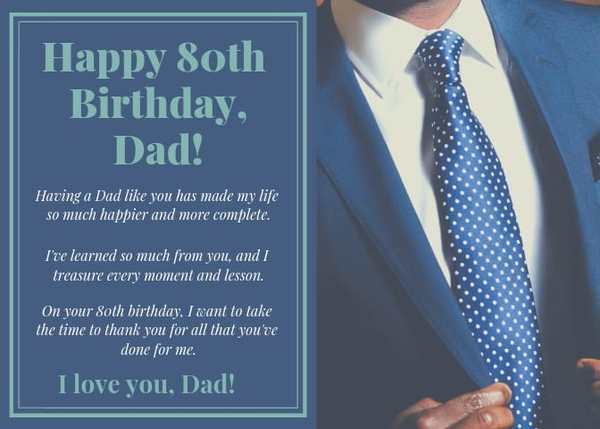 Before you blow out the candles on your 80th birthday cake, I hope you'll take a moment to remember what a wonderful father and friend you are. I'm so blessed to have you in my life.